In my opinion, there's nowhere on earth quite like the Bahamas. So, here's my listing of the top golf courses and resorts in the Bahamas. If you've never visited the islands, you're in for a rare treat. Consistent sunshine, balmy breezes, and those wonderful tropical drinks, and of course the resorts, all go to make golf in the Bahamas the ideal choice for a golf vacation or group outing. The islands regularly host world-class tournaments. There is no winter season to limit play, just year-round blue skies and warm weather. Nassau averages seven hours of completely sunny skies per day, and rain seldom lasts for longer than it takes to get under cover, even during the rainy season. An average winter temperature of 70° means the grass is always green and you can play golf in the Bahamas 365 days a year. There are some 700 islands in the Bahama chain. All are spectacular in their own way, but only a few are large enough to support a golf course. 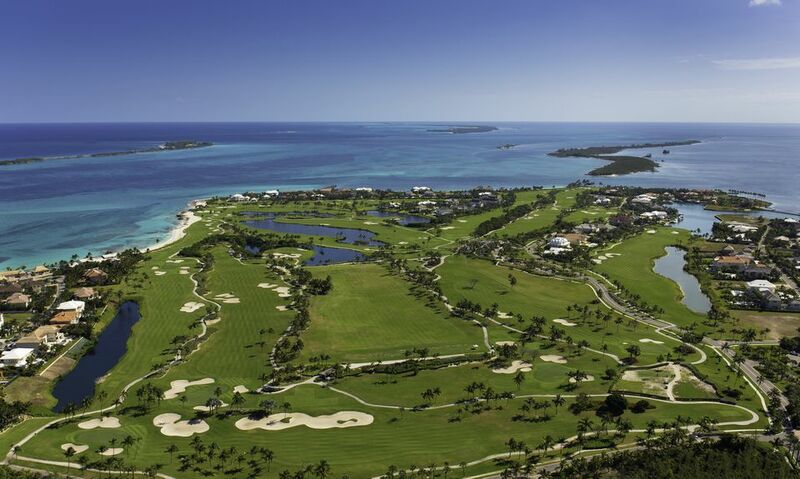 So, of all the islands of the Bahamas, only four spring readily to mind when our thoughts turn to golf vacations: Grand Bahama Island, New Providence Island (Nassau), Great Exuma, and Treasure Cay in the Abacos. Freeport is the brainchild of a Virginian financier with lumber interests on the island. In 1955, Wallace Groves was granted 50,000 acres of swampland by the Bahamian government. Upon this he built Freeport, now the second city of The Bahamas. Where to Play Golf in Freeport There is a great golf courses on Grand Bahama Island called the Reef Course, which is part of the Grand Lucayan Resort. Most of the resorts and hotels on Grand Bahama, with a couple of exceptions, offer good, clean accommodations. The big resorts can be compared favorably with any on the planet. The small hotels are typical of what you might expect in the Islands: clean and tidy, but a little lacking in amenities. Great food, Bahamian cuisine, tropical drinks, and the music of the islands. What more could you want? Nassau, capital of the Bahamas, has been the hub of the island nation for almost 500 years, ever since the days when legendary pirates like Major Bonet, Mary Reid and Blackbeard used its sheltered harbor as a haven from the British Royal Navy. Today, the pirates are long gone, only to have been replaced by bankers and financiers (pirates still, even if not in name) and the city is as busy and as welcoming as ever. The Exumas - two main islands, Great Exuma and Little Exuma, and 365 little islets - are a remote, beautiful land of rolling hills above aquamarine seas, breath taking beaches and pristine reefs where snorkeling, scuba diving and bone fishing are more a way of life than a pastime. Could paradise be any better than this? It could, at least to some: there's a brand-new, world-class Greg Norman golf course on Great Exuma. I have spent many a happy day in the Abacos, a glittering string of islands some 175 miles east of Palm Beach. These islands, just to the east of Nassau, offer us a whole new world of offshore cays and tiny islands to explore, boating, sailing, swimming, snorkeling, scuba diving and, yes, even Golf. These Abacos are sprinkled with tiny guest houses, family-run hotels, and a couple of resorts, all of which allow for a more personal experience. I have been traveling to, and writing about, the Islands of the Bahamas for more than 25 years. The Bahamas are my own, personal favorite vacation destinations. I love the emerald waters, the glittering white sands, the friendly people, and the overall feeling of well-being. I have NEVER had a bad experience anywhere in the Bahamas. I never miss a chance to hop on a plane and travel between these most beautiful of islands. I truly hope that you enjoy your visit to the Bahamas as much as I always have.